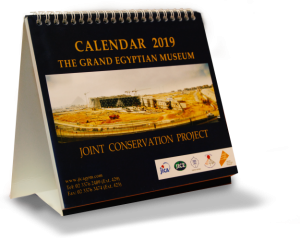 The Project of the Grand Egyptian Museum Conservation Center (GEM-CC) started the Phase II of the project on 1st July , 2011. During the phase, we will provide various training courses, in the next five year, for Egyptian conservators and scientists at GEM-CC based on the capacity development plan formulated during the preparation phase (Phase I). GEM-CC, our project counterpart, was built by the Egyptian government and opened in June 2010. Following the opening, transportation of artifacts which will be displayed and stored at the Grand Egyptian Museum (GEM) has been begun. Currently, more than 140 staff-members specialized in conservation, science and Egyptology work on preservation of these artifacts. Though the director of the center has not been appointed yet, the staff-members and facility are ready to accept a comprehensive capacity development training program. From May to June 2011, a Mission was sent from Japan to discuss the detail of the Phase II and decided to begin the phase in July 2011 to March 2016. During the preparation phase (Phase I) from 2008, it became clear that what knowledge and skills need to improve among the Egyptian conservation specialists. We also understood what they want to improve. Considering them, the capacity development plan was created with three main themes: “preventive conservation”, “conservation” and “conservation science”. It aims to bring up the center and their staff-members to be the conservation center fully capable of preservation of the most important ancient Egyptian collection in the world and, further, to be the center of conservation research in the North African and Middle Easter regions as well as in the country. It was mutually agreed between Egypt and Japan in January 2011 that activities of Archaeological Database Department (ADD) which has made a great contribution to re-structure the artifact database of the GEM will be passed on to GEM Information Center (GEM-IC) from April 2012. The information center is currently planned by the Egyptian counterpart and a transferring plan is under discussion between them and us. After the passing-over, we will keep providing professional advice to GEM-IC. Archaeological remains and artifacts that have been passed on from ancient Egypt are not only precious cultural heritage for the Egyptian, but are important tourism resource. During the January 25th revolution in Egypt, young Egyptian created “human-chains” to protect the Egyptian Museum in Tahrir and Alexandria Library from violence occurred around them. In the Project Phase II, we are going to provide more various, effective and meaningful training courses to those who involve in preserving and inheriting their heritage to the next generations.